Kitchen Fluoride Water Filter. Best for communities using chloramine and fluoride. Kitchen Fluoride Water Filter / Chloramines Water Filter for under the sink has 3 canisters. So this is an “extra protection” kitchen filter. This kitchen water filter effectively filters out FLUORIDE, CHLORINE, CHLORAMINES plus 600 other contaminants! 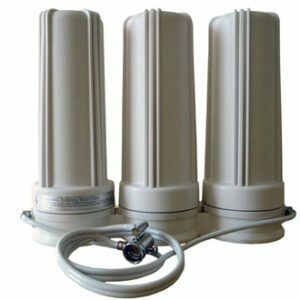 This is the best kitchen filter choice if your municipality uses chloramine and fluoride. The kdf filter material has been processed using a patented method that greatly increases effectiveness. All of our kitchen canister filters work on over 600 contaminants. Choose the right kitchen filter for you by whether you have chlorine or chloramine, and if your water is fluoridated. FLUORIDE MEDIA OPTION: Both are excellent. Activated Alumina is a safe resin, not what we know of as highly-processed aluminum. Calcium-based carbon is aka bone char. So if you are vegetarian, you may prefer activated aluminum. Select microfiber filtration wide-spectrum cartridge (KR101N) for finer filtration down to 1 micron. There have been news stories about plastic fibers in our water. 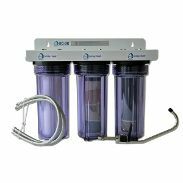 This 3-canister kitchen fluoride water filter / chloramines water filter is designed to take out CHLORAMINES in addition to FLUORIDE and work on all the other major categories of contaminants you want to remove from your municipal water supply. Many municipalities now add ammonia with chlorine to form chloramines, which are harder to filter. Therefore, if you don’t have chloramine in your water, you don’t have to get a filter to take it out. THIS UNIT ALSO EFFECTIVELY FILTERS CHLORINE! Some places move back and forth between water supplies using chlorine and chloramine. This 3-canister system WILL filter out BOTH thoroughly if you are in such a place (like Houston). Some ask what is the best filter. If you are in a municipality with fluoride and chloramines, this is the best undercounter kitchen filter. 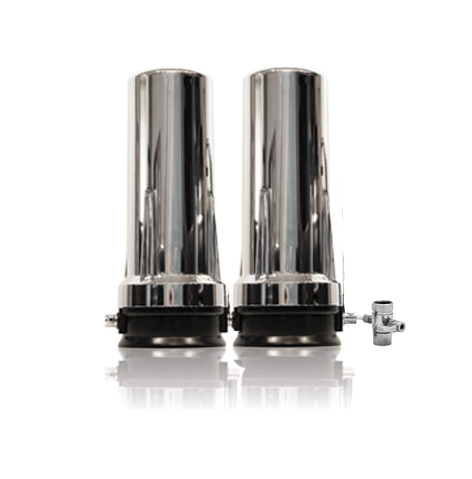 This uses an improved housing that can handle 33% higher pressure than the industry standard white canister. Note that the improved-durability housing was introduced after this video was made. Your system will look like the still photo. The idea is that they work on all the categories of contaminants. To see a larger sample list of contaminants filtered, see What Is Filtered? . All the filter materials used in our kitchen, whole house, shower and bath filters have been certified by the NSF. See Certifications. MORE FILTER MATERIAL MEANS MORE FILTRATION! WHAT IS INCLUDED? All you need. * Standard swiveling faucet that goes through the opening behind your sink. Faucet upgrades are available, and we recommend the upgrade. They look and work better, and last longer. * FLUORIDE cartridge for fluoride removal. CHANGE EVERY 6 MONTHS. * KR101N wide-spectrum cartridge for removal of heavy metals, chemical + organic contaminants, odor and taste. OR even better for third canister: KR101A. Same wide-spectrum filtration PLUS microfiber and cyst filtration to 1 micron. If you have some questions that haven’t been answered here, please email us at [email protected] Or call toll-free 866-482-6803. Leave a message if we can’t pick up, and we’ll call you back soon. This kitchen fluoride water filter / chloramines water filter delivers multiple-stage filtering. * The first canister has two sediment filters, 1 1/4 pounds of patent-processed kdf-85 formulated to remove chloramines, and a full pound of catalytic carbon which also works on chloramines and filters disinfection by-products like trihalomethanes. TOGETHER these media do far more than carbon alone can do. Carbon alone can’t do the job. * The second canister in your kitchen FLUORIDE water filter has a sediment filter and a pound and a half of activated alumina (an inert resin that is not aluminum) proven to effectively remove fluoride. OR YOU CAN CHOOSE calcium-based carbon which works equally well. This is a personal choice. They both filter fluoride and of course are completely safe. Calcium-based carbon is also known as bone char. So vegans and vegetarians may prefer activated alumina. People who incorrectly think activated alumina is the highly-processed product aluminum may prefer calcium-based carbon. * The third canister is a wide-spectrum filter that has two sediment filters plus 1 1/4 pounds of special patent-processed kdf-55 which removes chemical contaminants including chlorine, lead, heavy metals and more, and then a full pound of top-quality granulated coconut carbon for organic compounds including chlorination by-products, organic-based drugs, perchlorate. mtbe and hormones. Bacteria cannot grow in the carbon because of the kdf. Why are these filters better than others? Better quality fixtures and more of the right top quality filter material! This determines how much is filtered and how long the canisters remain effective. Note: TDS is not a measure of healthy water. TDS (Total Dissolved Solids) is a measure used for Reverse Osmosis filters. You do NOT want low TDS. If you have low TDS that means that you are not getting the trace elements and minerals that the body needs like chloride, calcium, magnesium and zinc. Please look under the Education tab, Water Filters for other certifications and test results. Fluoride Cartridge (mid-year) Change the fluoride cartridge twice a year. If you go a year before changing the fluoride cartridge, you are not filtering out fluoride for months. A good customer put this review on the refills for this filter. You can see his original post on the refill item. Mark rated this filter 5 stars and wrote: “Clean, fresh, safe water for a fair price. I hire a pro to install but the cost is minimal. Peace of mind and body, a recommendation is an all – time no brainer. Great product. I have an eczema prone kiddo and cleaning our water of chlorine and fluoride have been essential for his skin.Its a great company to do business with – excellent customer service. We have had some issues with our last few orders and they were always resolved in a timely manner. In an effort to clean up my life, not just the food I ingested but also the water, I discovered friends of water. Such a great company. We got this three canister under the sink filter. We really like having the dedicated faucet. Our water tastes great and the peace of mind I have, knowing that I am not ingesting fluoride and chloramines and who knows what else from my tap is worth so much. We change the fluoride filter at six months as recommended. It’s still debatable whether fluoride is good for adult teeth, topically, but the science is clear that it is detrimental to ingest it. And now they are putting it in baby formula! I highly recommend this company and their products. Excellent customer service! Super responsive. If you have a question just call them. Excellent products and very responsive/thorough customer service. We use the under counter Kitchen FLUORIDE Water Filter: Chlorine, Chloramines, Plus 3 canister filter system to feed out ice maker, chilled water dispenser and our counter top prep sink pot filler faucet. The system works flawlessly. 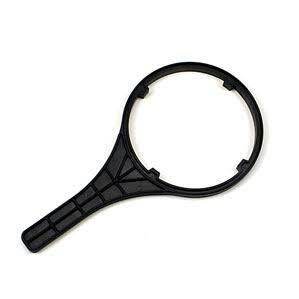 Changing the filter cartridges is easy with the supplied filter wrench. One requirement we had when researching filtration systems was that we did not want a any drop in water pressure on the outlet side of the filter stack. This system supplies filtered water at the same pressure as the unfiltered faucets. We are very happy with this product’s performance. There are SO many opinions out there as to what is the best drinking water and how to filter it. Reverse Osmosis, Distilled, Spring etc… but I finally settled on this flouride/ chlorine/chloramine 3 canister filter and I have so much more peace about the quality of water me and my family are drinking. The filter came fast and my husband installed it himself easily. After almost getting a gravity fed filter, such as berkey/propur, I went with this one after hearing those don’t filter out monochloramines (which after contacting my city water, it does have, and is apparently really hard to remove- pet fish will die if you don’t remove the ammonia from the water… so what is it doing to us!?!?) It’s an investment that I feel is worth the money due to all the heavy metals and poisons it’s removing. I can definitely tell the taste difference, with no more smell of chlorine like there still is after I wash my dishes without the filter! We love these filters!! I cannot tell you how many times I have referred people to this company. They have been wonderful to work with and so patient answering all my questions about the quality. I truly believe this is one of the best filters out there with what it filters out. The best part is the flow rate is excellent so you are not standing there waiting for long periods of times to fill water jugs or bottles. We are so happy with the quality of these filters. I have bone and endocrine issues, and recently read that fluoride can be a huge problem in that area. I’m looking forward to improving my health with much purer water. We called Tim on a Saturday, and he was happy to spend time explaining the products to us. The system is easy to install- my Hubbie had it done in 30 minutes. The flow rate on the upgraded faucet is very impressive; it makes filling pasta pots a breeze. So pleased with our new system- from Chicago, with some of the highest fluoride and chloramine levels in the country! I feel quite happy with the filters. Knowing that the harsh fluoride and chloramine in our water is filtered our and not harming me or my family gives me great peace. We became concerned about the contaminants in our tap water more than 10 years ago. We started with your typical water pitcher but realized that we also wanted to filter fluoride. I started researching online and found Friends of Water. We purchased their fluoride filtering water pitcher and used that for a couple years. Four years ago, we moved and thought it was a good time to take our water filtration a step further. We purchased a 3-canister under the sink kitchen system from Friends of Water. We wanted it to filter not only at the kitchen sink but also our refrigerator. We had the unit installed next to refrigerator water line in the basement and ran a line to the kitchen sink. It’s been working perfectly. We were so pleased with the pitcher that we purchased an additional one and gave them to our 2 adult children. I recommend Friends of Water for their prompt and courteous customer service and high quality products. We have been very pleased with our water filtration systems. Thank you!! I have been using the three canister filters for many years (replacing them annually). I am incredibly pleased with how well they work. The water tastes great and I know my family is drinking healthy clean water with no harmful fluoride and other unhealthy contaminants. I very highly recommend Friends of Water!! I have personally used these filters for the past 2+ years, and I have recommended them to family as well. I love that they filter out contaminants and especially fluoride. Would recommend these filters and Friends of Water! Real easy to use, been using it for 8 years and survived a move. Great stuff! We purchased our 3 under kitchen counter filter system in 2013 and love having our drinking water filtered without refilling heavy water containers. My husband installed it himself without any problems using the directions provided. We change the filters annually, and the fluoride every 6 months. I purchase the 2nd fluoride filter with the 3 filters to save on shipping and time. The water tastes great and am so happy that my children and grandchildren benefit from the clean filtered water. I use for drinking and cooking and steaming vegetables. Very happy with our purchase and ease of ordering filters online. Can’t express enough how much I appreciate clean and good tasting (smooth and non-metallic) water at an affordable price. This 3-canister combination is perfect! Chloramine is used in many areas instead of chlorine. You can call the city to find out which one they use. And the fluoride filter? Couldn’t believe it when I discovered this here–no more ingesting large amounts of this toxic chemical!